Can EPS help you live longer? Medical EPS is a relatively new diagnostic procedure in which we can see just how well the electrical side of your heart is working. Just the same way as your engine needs a correctly timed electrical spark to each cylinder, your heart chambers need a correctly timed electrical impulse to make them contract at the right time (the rhythm or heart beat). When the electrics start malfunctioning, the heart will also malfunction. Disturbances of normal heart rhythm may only cause annoying symptoms (palpitations, lightheadedness, dizziness) that pose no serious threat to life. Other rhythm disturbances, however, can be associated with dangerous risks (loss of consciousness, seizures, stroke or cardiac arrest). These varying symptoms can occur when the heartbeat is seriously slowed, dangerously rapid, or just highly irregular. Heart rhythm disorders can be part of almost any type of heart disease, and can be provoked by various medications or electrolyte abnormalities, but can also occur in the absence of readily identifiable underlying heart problems. These disorders are called ‘arrhythmias’. Some arrhythmias can occur without symptoms and may only be picked up during an EKG (electrocardiogram), but the simple EKG will not pinpoint the electrical breakdown, only indicate that there is a malfunction somewhere. An ElectroPhysiologic Study (EPS) is one of a number of tests of the electrical conduction system of the heart performed by a cardiac electrophysiologist, a specialist in the electrical conduction system of the heart. The EPS should pinpoint the location of a known arrhythmia and determine the best therapy, determine the severity of the arrhythmia and whether you are at risk for future life threatening heart events, especially sudden cardiac death, and can also check the efficacy of medications being used to regulate heart rhythm, and evaluate the need for a permanent pacemaker or an implantable cardioverter-defibrillator (ICD). The way the EPS is done is where modern medical technology is used. Just as when an electrician tests the conductivity of a wire with a testing light, to test the heart’s electrical system, several thin, flexible, electrical catheters (fancy wires each about the thickness of a strand of spaghetti) must be inserted into various parts of the heart, to test the electrical pulses. To provide maximal sterility of the catheters being inserted, the introduction sites are thoroughly cleansed. Most catheters are inserted via needle punctures through the anesthetized skin, making cutting and stitching unnecessary. Once the catheters are carefully positioned inside the heart, the electrophysiologist mans computer equipment, making recordings of the heart’s intrinsic electrical properties. Occasionally, electrical stimuli are administered to the heart by the conductive catheters, to check its response. The catheters enter the heart via the right atrium, which is the low pressure side of the heart. The advantage of this is that the right atrium is where the electrical generator (the SA node) is located. The right atrium is also the location of most of the common re-entrant pathways associated with atrial flutter. If a catheter is placed with the distal tip in the right ventricle, it may be possible to measure conduction through the central electrical tissue bundle, which is useful to determine the level of heart block (where the atria and the ventricles beat independently). If the catheter is placed in the coronary sinus, it is also possible to measure electrical activity in both the left atrium and the left ventricle without entering the high pressure arterial system associated with the left side of the heart. EPS can save your life. What a lovely man you are? Entrusting the care of your Honda Phantom to Aunt Hillary. However, as you say, this is an advice column, so here goes: Since your mechanic knew what to do with porting your head (did he begin at your ears or your mouth?) as well as relieving you (sounds very naughty, Uncle Bill), he then is surely the one to tell you what to do with your 95 octane problem. Agreed? So ask the nice man, my Petal, not Auntie Hillary. In the mean time, try siphoning some 130 octane avgas from a plane near you. That always worked in my boyfriend’s Beezer Bantam. After a few misfires at finding a good woman, I started reading your column and found that I wasn’t the only one with problems. So I could see where we were all going up the wrong road. I slowed down and took a turn the other way and very soon met a beautiful woman who was interested in me and not my bank account. She has never asked me for a penny for anything, while all the ones before always had their hand out for something or other, new phones, gold, motorcycles, house for Mama Papa and all the other reasons that these women seem to find. I could appreciate her for what she was - a good woman. I consider myself to be very lucky to be with someone like that. For my so-called friends it has been a bit of a shock, as she used to work in a cabaret, but I don’t believe it is important what anyone used to be before. Sorry no champers, for guessing. Yes, she is a katoey, but is still the best woman I’ve ever been with. Yours is an intriguing story, and I agree with you that what someone was before really does not matter. It is the ‘now’ that is important, and if you and your “best woman” are happy in the ‘now’, that is all that matters. Ignore those people who would make judgments, it is your life, not theirs. Graham, I also want you to read the letter below, it came in a couple of years ago, but is very pertinent to your life. I have been a loyal supporter of your particular column. I find your column very rewarding in that it is sort of like group therapy for us Thailand stricken folks. I find you very caring, loving, but mostly supportive of one and all who write in with their trials and tribulations that are sincere and straightforward. There are certainly so many varied experiences that us farangs encounter when first arriving at the gates to heaven on earth. I do not want to get into any long stories about my particular adventures in the wonderful land of smiles, but suffice to say, they have all been earth shattering, and downright addictive in nature. After many years of learning from my mistakes, I now find myself engaged in a loving, caring, and real marriage to a bar girl. In my eyes, and that’s the key; if we truly fall in love with another human being, then we should be willing to ignore all the flack, and give all our hearts and souls into that relationship, and embrace that individual’s culture and customs and adapt! Simple as that! I think the key is learn from our mistakes! And make the necessary adjustments if that is really what you want. MONEY! Money is for here and now, so let’s enjoy all our adventures, good and bad, and try to make this planet a better place for everyone, not just the chosen few. Thanks very much for all your hard and entertaining work Ms. Hillary. Thank you for all the nice words. It is always nice to think that someone appreciates what goes into the column. You are also very caring and loving, and have obviously developed a broader viewpoint of life, and as you say, “lets enjoy all our adventures, good and bad, and try to make this planet a better place for everyone, not just the chosen few.” I also like your philosophy on love, especially putting hearts and souls into the relationship. Sure, you may get burned on the way through, but it is never the end of the world. If you made money once, you can make it again. If you loved once, you can love again. And you are right, my Petal. Learn from your mistakes - in everything in life. Again thank you. You made my world a better place today as well. Would you believe me when I say that you can get a very valuable piece of photographic equipment at the local Indian tailors? Probably not, but you really can buy something there which is of inestimable value for special effects in photography. Indian tailors fit into low budget special effects photography, and when I say “low budget”, that is exactly what I mean. In my personal library I have books that claim to do just this and then go on for one chapter about the “low budget” equipment required - like an enlarger, registration table with registration pins, copy stand and photo floods and studio strobes. Hardly what I would call low budget! However, it is possible to produce many special effects photos without having to purchase expensive equipment, work with slides only or have studio strobes. The first item you need is a roll of black velvet. Black velvet is a very important part of photography, and in my studio, I used to keep several meters of the stuff. Why? Because it is one of the easiest ways to introduce some very different effects into your photographs. The secrets behind the use of this material include the facts that it is non-reflective, it does not affect exposure values when taking the shot and shadows do not register on it. Mind you, fluff, dust, cigarette ash and dirt does, so you have to keep it scrupulously clean! Because it does not affect the final image, this makes black velvet the ideal material to use as a background when you wish to combine images, or do other special effects using Photoshop or whatever is your favorite graphics package. 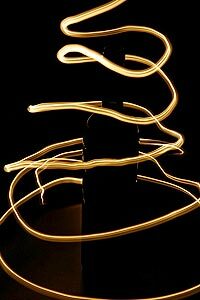 Another use for black velvet is in making pictures of light trails. These can be very spectacular special effects pictures and are very easy to make. Stick the black velvet on the ceiling and suspend a torch from the centre. With the camera facing upwards, twirl the torch and record its movement for ten seconds or so. You have just made a totally original print! Photo montage is another simple effect you can produce, using the black velvet as the background. Here you let your creative self run riot. You can produce any picture you want, whether it be yourself standing on top of the Statue of Liberty or three elephants standing on a beach ball - you are in total control! With this type of special effect you have to cut out the elements you want from other pictures, be they prints or magazine photos or whatever. Cut carefully and then run a black felt-tip pen around the edges (See why? It will sit on black velvet!) and you are ready to combine all your subjects. Put your composition (photo montage) together and positioning your camera above the montage, look carefully through the viewfinder. This is how the shot will look, remember. Reposition any items at this stage. Next important item is to keep the camera back (film plane) parallel with your background as this will keep all the elements in focus. Now shoot! If you find the direct flash gives you a reflection problem, you can use household “floodlights”, one each side at 45 degrees to the surface. You will get a “warm” color cast, but since you are producing “surreal” photographs, it does not really matter. Have fun this weekend, after you’ve been to the tailors! It’s been drinking too much for years - this became worse when macro strategy (under Greenspan and Bernanke) made all the booze more readily available - Paul Volcker is getting an extremely positive retrospective re-appraisal because of the actions of his successors - what was the phrase about taking away the punch bowl? I cannot argue with that but I would say that, so far, this is the worse financial catastrophe since the Great Depression but it may not be finished yet and every US president since and including JFK is culpable. Clinton repealed Glass-Steagall, Nixon removed the gold standard, Bush presided over the current fiasco - none of these presidents have had the conviction to challenge the way that society has moved and FNM/FHMC are reflections of that. That is pretty close to and certainly not more pessimistic than our take - the question is whether the financial system will remain intact. Despite the panics, the system has, with support, stood up so far - we were terrified that we would have seen Armageddon by this stage. We were wrong. However, just because it has not happened yet is not the same as saying it won’t happen - for us the future of Citicorp is the key event here. The average American created events of last weekend. Unwittingly. People have bought unsustainable dreams from slick politicians peddling snake oil ever since the 1960s started - JFK and the US nation, in the era of hope and technology, were made for each other. Corners were cut, people started to act for the moment and eventually, as my mum always used to say “if you have your fun, you’ll have to pay one day” - that day is now. I do not blame Jimmy Cayne or Stan O’Neill any more than LBJ or JFK or Dubya. I think that it is too cruel to say that people get the leaders that they deserve - the people (whether American, British, Irish, Thai, etc.) have been duped and their morals have gone out of the window - they were happy to be duped at the time but now they are realizing the cost; if only they had known what was going to happen then they would not have gone along with this... but they didn’t know... and they didn’t ask and they didn’t even know what they should ask... that’s not meant to be a cruel or a moral judgement, just an observation - my job is to observe and to try to see how this affects the client money that I am trusted with. 1) Diversify - there are multiple asset classes. Use them; cash is an asset class, now is a good time to be overweight cash (and commodities and pure arbitrage and hedge funds). 2) Make the most of each asset class - if you’re going to have high allocations to cash, get the best returns on cash. 3) Genuinely diversify - no point splitting between just two asset classes that currently have high correlations (e.g. equities and property). 4) Avoid Beta - now is a time for lowering risk. When there is so much uncertainty the best that you can generally do is try to insulate yourself. 5) Liquidity - even with the best laid plans. Only take positions from where you can see the exits and only ones which do not have high exit penalties. The MBMG philosophy right now is that when the really big crap hits the really big fan it all correlates to one - in times of extreme distress everything suffers - Asian may be in better fundamental shape than the west BUT we have been avoiding equities here since last year because when the US sneezes etc. - Asian markets lost 4% yesterday because of FNM and FHMC; Asia’s time will come again sooner than the west’s but the sidelines is a good place to be right now. Diversification, risk management, squeeze the pips and stay liquid. Despite all of the above, this is an opportunity for portfolios and so far nothing has played out that good fund managers such as Scott Campbell were not expecting. Thanks to the boys at Midas Capital, MBMG portfolios have no exposure to banking stocks or finance companies and from the results of daily traded assets such as gold and currencies, the last couple of weeks have been extremely profitable for our managed currency client portfolios. On Sunday afternoon a small group of people – some students who had seen the notice at Payap and a few friends of the pianist Bennett Lerner went along to a ‘pre-tour run through’ in a small room at the Mc Cormack campus. All very informal: a not too brilliant piano, rendered magical by a very brilliant pianist in a cleverly programmed recital of early 20th century music. By now Bennett should be in the midst of a busy tour of Japan, hopefully delighting audiences as he did last week. What made the event so special was the freshness of so much of the programme. It opened with a bravura piece by a lesser known Russian, Alexander Tcherepnin, composed on the momentous year 1918, when he was just 19. The not unexpected conclusion (except for a vivid Charles Ives encore) was by Debussy and there were two superb works by Faureé. But it was the youthful exuberance of the other works that proved so captivating. Four by Copland, composed when he was between 19 and 26, two ‘tangos’ by his contemporary Virgil Thomson, written in his late twenties and six related works by the writer and composer Paul Bowles, also at the age of 27. Lerner obviously relished the programme, which comprised works by two of his favourite composers and others by those who were his friends. With the missionary zeal of all good teachers he no doubt enjoyed giving the lie to the nonsensical notion that 20th century music is invariably discordant or inaccessible. A fallacy founded more on ignorance (not in itself blameworthy) than experience and too often worn as a badge of misplaced pride (very blameworthy). It would be great for Chiang Mai’s concert goers could be given a repeat version of the programme in the coming weeks or months. Gershwin was a sadly short lived contemporary of two other fine representatives of the great American song book, Ellington and Porter who were featured at a concert later the same day (see elsewhere for a review). It reminded me that a large percentage of the best American (and British) composers of the 20th century were gay. Porter, of course, and the greatest lyricist of them all, Lorenz Hart. Also, in the highbrow bracket, Copland, Thomson, Samuel Barber and Leonard Bernstein and from across the pond Benjamin Britten and Michael Tippett, among many others. They also are united in living a long time, as do many of the great conductors. Let’s hope that a love of music also has beneficial effects, along with its practice. Quite a few actors enjoy long and active lives too and I think much of that has to do with being able to go on working after normal ‘retirement’ age – like writers and artists. Sad to see that Paul Newman died just a few days ago – but he managed to pack a great deal into his 83 years and his legacy as a philanthropist as well as fine actor will last for decades. I had the pleasure of meeting (and drinking!) with him a few times and he had the unpretentiousness that comes only with true talent and an unactorly concern with those around him. In his introduction to the pieces by Paul Bowles, Bennett mentioned the contrast between his effervescent compositions and his cool and often cruel novels. It reminded me that Bowles was also a great short story writer – one to rank alongside Hemingway and Fitzgerald. Bowles excelled at the concentrated form and one story is barely four pages long and opens up a complete world to the reader. Some writers make short stories their speciality but, like poets, have a hard time making financial ends meet. Others make it a sideline, although in the case of Annie Proulx, who has a new collection of stories out this month, they take over and I believe her best work is in the short form. The same goes for the English writer Elizabeth Taylor, whose Devastating Boys collection is a sustained masterwork. Look out for them in Chiang Mai’s wonderful selection of second hand bookshops. By the way, is it my imagination or are women more comfortable with short stories and novellas (think of Carson McCullers and Tillie Olsen, let alone Edith Wharton)? Perhaps they are less concerned with what is a more fragile art form, whereas men are attracted to a bigger canvas. People often say that short stories are ‘less satisfying,’ as though every composition has to be a lumbering symphony, every painting a Nightwatch or every movie an epic. Nonsense, of course. In fact about as silly as suggesting that 20th century art (music especially) is somehow more daunting and less interesting than that from previous centuries. Star Wars: The Clone Wars: US Animation/Sci-Fi – A new adventure in the “Star Wars” series, here done with animation. The movie has gotten generally negative reviews, most saying that the mechanical animation and a less-than stellar script make The Clone Wars a pale shadow of George Lucas’ once great franchise, and a cheap excuse for a big-screen spectacle. It’s more like a long Saturday morning cartoon, and a trailer for the upcoming new Star Wars series on the Cartoon Network. Parents may be perturbed by the film’s relentless violence. Disaster Movie: US Comedy – Returning to their seemingly bottomless well of flatulence humor, racial stereotypes, and stale pop culture gags, Friedberg and Seltzer have produced what is arguably their worst “Movie” yet. Seldom has a film been more appropriately titled. Reviews: Extreme dislike or disgust. Luang Pee Teng II / The Holy Man II: Thai Comedy – Bad boy becomes monk, meets misadventures, makes merit. The first Luang Pee Teng was the top Thai film at the box office in 2005, earning 141 million baht, even beating out Tony Jaa in Tom Yum Goong. This second of the series has a new star, Thai rapper, hip-hopper, and ex-skateboarder Joey Boy, one of the Thai stars in the ill-advised and poorly-received rock version of the Ramakien that played Lincoln Center in New York in the summer of 2006. The cast is filled out by the usual contingent of Thai TV comedians. Eagle Eye: US Action/ Mystery/ Thriller – Shia LaBeouf and Michelle Monaghan play two strangers thrown together by mysterious phone calls from a woman they have never met. Threatening their lives and their families, the phone calls push the two into a series of increasingly dangerous situations using the technology of everyday life to track and control their every move. As the situation escalates, these two ordinary people become the country’s most wanted fugitives, who must now work together to discover what is really happening. Fighting for their lives, they become pawns of a faceless enemy who seems to have limitless power to manipulate everything they do. The script has the feel of something once substantive, but which was poked, prodded, cut, and crimped until all semblance of intelligence was wrung out of it. Apparently, it means to say something about anti-terrorism surveillance and civil liberties, but most reviewers who try to say what it’s about, say it’s about as dumb as can be. Vista has a Thai-dubbed version as well. Mixed or average reviews. You Don’t Mess with the Zohan: US Action/Comedy – Starring Adam Sandler. Zohan is an Israeli commando who fakes his own death in order to pursue his dream: becoming a hairstylist in New York. It’s an Adam Sandler comedy, and if you like his kind of low crass comedy, you should like this one. Here he plays the Israeli/Palestinian conflict for laughs. I laughed. A lot. And cringed. A lot. Mixed or average reviews.Baan Phee (Phop/Pob) 2008: Thai Horror/ Comedy – At least the 11th installment of this popular ghost/ horror/ comedy series. In Thai with no English subtitles. Mamma Mia! : US/UK/Germany Musical/ Romance – Starring Meryl Streep. Immense quantities of popular ABBA music that I find horrifyingly infectious. It’s an extraordinarily vivacious and energetic musical that is bound and determined to make you sing and dance and feel good about marriage. Mixed or average reviews. At Vista only. E-Tim Tai Nae: Thai Action/Comedy – About a boxer performing in a show in Pattaya who falls in love with a Japanese tourist. Looks dreadful, unless you like comedy based on the smashing of testicles. Body of Lies: US Drama – With Leonardo DiCaprio and Russell Crowe, about a CIA operative who attempts to infiltrate the network of a major terrorist leader operating out of Jordan. Based on a 2007 novel by Washington Post columnist David Ignatius. Beverly Hills Chihuahua: US Comedy – In this Disney comedy, a pampered Beverly Hills Chihuahua (voice of Drew Barrymore) finds herself accidentally lost in the mean streets of Mexico without a day spa or boutique anywhere in sight. This one actually looks quite delightful, to gauge by the previews. Tropic Thunder: US Comedy/War – I have seen this, and I heartily recommend the film, but only for those not easily shocked. You might just have the best laughs you’ve had in years. Robert Downey, Jr. gives another amazing performance, this time playing a black. It’s an action comedy about a group of self-absorbed actors who set out to make the biggest war film ever. After ballooning costs (and the out of control egos of the pampered cast) threaten to shut down the movie, the frustrated director refuses to stop shooting, leading his cast deep into the jungles of Southeast Asia where they inadvertently encounter real bad guys. Directed by Ben Stiller. Generally favorable reviews. The Elephant Apple – but where are the elephants? At the turn of the 19th century, there were at least 100,000 domesticated elephants in Thailand. By 1950, due to the decline in the logging industry, this number had reduced to around 13,000. The elephants’ natural habitat, the forests, were severely decimated by then, leaving even fewer of the giant pachyderms in the wild. The situation now is even worse, with as few as 5,000 domesticated elephants, and even fewer in the wild, a similar fate to that which befell the working Shire horse in the UK. A fruit from the forest streams, beloved by elephants but not particularly liked by humans, is the Elephant Apple, Dillenia indica. Even if we don’t like the taste or have no elephants to feed it to – never mind, as the tree itself is highly ornamental, showing glossy, deeply ribbed ovate and toothed leaves and round green buds which hang like Christmas decorations and open with hanging white petals in a spectacular radiating style. This is one of the loveliest flowers to gaze up at whilst savouring its delicate scent. The resulting green fruits are highly ornamental and long-lasting, ideal for the “green garden,” and are designed to disperse by floating down forest streams and rivers. The taste of the fruit resembles that of unripe apples, and can be used in curries, or, with added sugar as a drink or jelly. The pulp can be used to wash hair and is reputed to prevent hair loss! The bark of the tree has medicinal uses, particularly for mouth infections and thrush. The clue to planting and growing is given by the tree’s method of dispersal; this tree should not be planted in dry or exposed areas. It is pretty as a small tree in a large planter, but if planted out, can grow to 15-17 metres in height, with a similar spread underground. When trimming a pot-grown tree to size, try to also trim the roots, adding some fresh compost. This will prevent the formation of a tap-root, and encourage fibrous roots. Here is another hand to plan the play on. But this is a bit different – if you find the solution, please let me know! I played this hand at the regular Sunday duplicate game at John Bucher’s place. The hands and bidding are shown below. I was sitting South. You may think that I overbid the hand, and I would have to agree with you. After all, hand and dummy combined have only 19 high card points, fewer than half. Whatever, I ended up as declarer in four spades. As it happens, I made the contract, but only by way of a defence error (a very understandable error – defence is by far the most difficult part of bridge, because you cannot see your partner’s hand – but still an error). Two rounds of high hearts were led and I ruffed the second round in hand. I could see three certain losers – one trump (if I were lucky), one heart and one diamond. My first thought was to try and limit trump losers. I played the two top clubs, throwing the last heart from board. This was to discourage a heart lead which would further reduce my trump holding. Then, I ruffed a club on board to get there for the spade finesse. The eight of spades was led from board and ducked round to the king. West now had a choice of unattractive leads. He eventually settled for leading back a trump. I took East’s queen in hand with the ace.